If your parent is showing mild or early signs of dementia, do they need to move into memory care? At Aegis Living, we offer a program for our residents who may be showing signs of memory loss or dementia but are not yet ready to move to our memory care (Life’s Neighborhood) full time. Transitional care focuses on meeting unique needs early in the progression of their symptoms and providing them the support to move smoothly into memory care if needed. Dementia is a general term referring to a decline in cognitive ability that interferes with the normal activities of one’s daily life. Dementia is not a specific disease but an overall term that describes a group of symptoms associated with a decline in memory. And the most common type of dementia is Alzheimer’s. Vascular dementia, which occurs after a stroke, is the second most common dementia type. Also, medical conditions can cause dementia-like symptoms, including depression, Vitamin B12 deficiency, hydrocephalus (water on the brain), tumors, UTIs, Thyroid disease, and alcoholism. Drug interactions can also cause symptoms of dementia. As we age, our liver is less efficient at metabolizing prescriptions drugs and our kidneys eliminate them for our bodies more slowly. Thus, medications tend to accumulate in the system. And elderly people who take a cocktail of medications are especially vulnerable. Drugs that have been known to cause dementia-like symptoms include antihistamines, antidepressants, cardiovascular medications, and sedatives. How do dementia symptoms progress? There is no set path and symptoms will progress with each person differently. The type of symptoms and the order they are experienced will vary greatly as well. Some residents will experience a rapid change in their behavior and personality, while others could progress very slowly with gradual changes in behavior. There is no predictor. Either way, we will meet their needs. At Aegis Living, we have worked with thousands of residents living with memory loss. We understand that no two days are alike with a resident who has dementia. They will have good days, and they will have difficult days. But our expert staff is capable of redirecting, soothing, or managing difficult behaviors. They take joy in the little moments and celebrate every day with our residents. They keep a close eye on changes and adapt care plans to meet those new challenges. Our Life’s Neighborhood ™ is a warm, comforting and supportive environment that nurtures our residents living with memory loss and the effects that can come with it. Ultimately, this memory care area of the community may be the best place for your loved one. But we want to meet every resident where they are in the progression of their memory loss and provide a solution that is the best fit—and that solution might include an interim step of transitional care. If your parent is experiencing some symptoms of memory loss or has been diagnosed with Alzheimer’s, they may not need to move into memory care immediately. If they are forgetful, but their personality and behavior are relatively the same, then they could benefit from transitional care. Our unique transitional care services provide progressive assistance and a gradual transition for those with mild or early-stage memory loss from assisted living to memory care. This option can be a comfort and support, especially when surrounded by peers going through the same transition. The goal of transitional care is to allow residents to cope more successfully with their memory loss and changes in their behavior. We strive to slow the progress, if possible, or lessen the impact of these changes with a structure that socially engages our residents, reduces their anxiety, and increases self-esteem. What does transitional care provide? 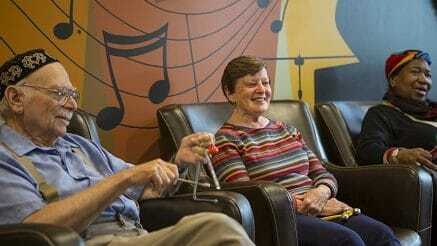 Focusing on smaller group settings that are less distracting, activities are specifically structured to meet each resident at their cognitive level, while still challenging and stimulating brain activity. We encourage interaction and participation from our residents to avoid the isolation that can sometimes happen with memory loss when a person tries to withdraw or is embarrassed. We provide an environment of constant supervision from specially trained staff. Our staff is keenly aware of the challenges that your loved one is facing. They can help to manage the confusion, nervousness, low self-esteem, and anxiety that can come with memory loss. Getting proper nutrition can be difficult for those who suffer from memory loss. Residents with dementia may forget to eat or to drink to stay hydrated. We closely monitor our residents’ eating habits, ensure they get a balanced diet and enough liquids throughout the day. Dining is also a social event to bond with their neighbors and friends over a good meal, and we encourage this comradery. We take safety measures to make sure our residents are secure, especially at night. Motion sensors let us know if a resident gets up in the middle of the night and may need assistance. We also have precautions in place to help to ensure residents do not wander, which may be possible for those with memory loss. Your parent has settled into their new home. They have made friends and become attached to the staff. Moving them to another facility can be very disruptive. If your loved one is living in our assisted living community, they can stay in their apartment while becoming more familiar with Life’s Neighborhood™ and the staff there, as necessary. It allows for a smoother, seamless transition from each level of care within the community. What is Life’s Neighborhood ™? The core of our Memory Care communities is Life’s Neighborhood™ – a nationally recognized program developed by Aegis Living. The program was designed to improve the quality of life and increase enjoyment for people living with memory loss. The goal is to reduce stress and anxiety by recreating fond memories in a comforting setting. The program creates a bond between the staff and the resident—whether chatting while strolling through the courtyard, interacting in the Julia Child’s kitchen, or looking at old photos in a scrapbook. Life’s Neighborhood ™ encourages interaction in a secure environment where residents are safe from wandering. When will my parent need to move to Life’s Neighborhood™? There may be a point where it is in the best interest of your parent’s health, happiness, and safety to move to Life’s Neighborhood ™. This is determined on a case-by-case basis with you and the staff of your parent’s community. But if the progression of their memory loss means that they are not safe, then they are still able to live within the community that they are familiar with but in the memory care area. Our Life’s Neighborhood ™ community is designed to handle the unique needs of our memory care residents. A very common symptom of dementia is agitation or anxiety, our memory care staff is very familiar with these behaviors and skilled at redirecting or providing comfort to calm residents. Another common symptom of dementia is wandering or exit-seeking. Our memory care wings are secured so they cannot wander off and exits are camouflaged. If your parent begins to experience sundowning, they may be able to benefit from the light therapy offered in Life Neighborhood ™. Sundowning is a noticeable change in behavior in the evening as the light outside changes. There are so many benefits to living in Life’s Neighborhood ™ but we understand this can be an abrupt change for some of our residents. Transitional care can help provide a smooth transition to the next level of care. If you have more questions about transitional care or Life’s Neighborhood™ connect with your community’s General Manager or Care Director and they can share more details.